3Prof. Dr., Dokuz Eylül Üniversitesi Tıp Fakültesi, Göz Hastalıkları ABD, İzmir, Türkiye Purpose: To evaluate the result of topical brinzolamide treatment in patients diagnosed with X-linked juvenile retinoschisis (XLRS). Subjects and Methods: Files of 16 patients with XLRS diagnosed between January 2010 and January 2016 were reviewed retrospectively and 16 eyes of 8 patients who were on topical brinzolamide treatment for at least 12 months or more were included into the study. Changes in best-corrected visual acuity (BCVA) and central macular thickness (CMT) were evaluated. Results: Mean age of the subjects was 12.8±4.2 years (Range: 6-18 years) and the mean follow-up time was 36.0±24.0 months (Range: 12-84 months). Median BCVA with Snellen chart was 0.2 (Range: 0.1-0.6) and mean CMT was 509.3±124.7 micron (Range: 215-646 micron) at the baseline. Topical brinzolamide was prescribed as tid in all patients. Median BCVA was 0.25 (Range: 0.1-0.7) and mean CMT was 457.8±135.6 micron (Range: 202-714 micron)) at the last visit. There was a statistical difference in baseline and fi nal BCVA and CMT (p<0.05). 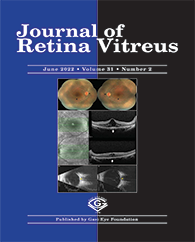 The BCVA improved more than one line in 9 eyes, unchanged in six eyes and was worsened more than one line in one eye despite the decrease of CMT. A reduction of at least 20% in CMT were achieved in 4 eyes, 10-20% in 4 eyes, under 10% in 5 eyes at the end of follow-up. Increase of CMT was observed in 3 eyes despite the topical brizolamide treatment.